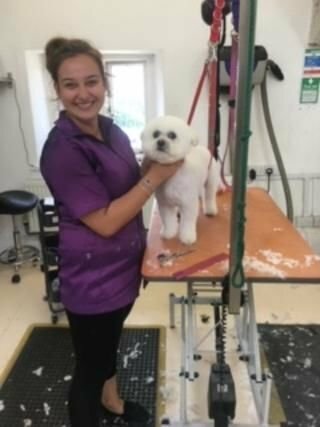 I joined Canis in 2016 as a grooming assistant, and during my time at Canis, Judy has helped and encouraged me to undertake all the training and assessment opportunities here and I now have a City & Guilds award 7763-02 Certificate for Dog Grooming Assistants, and I am also about to complete my 7763-03 Certificate in Dog Grooming. I hold a current Pet First Aid Certificate and also one for people. Before arriving at Canis, I trained at Abingdon and Witney College in Animal Care. My particular skills are in handstripping terriers, and I love trimming Bichon Frise. At home, I am big sister to Coco, a Maltese x Shih Tzu, as well as to two cats. If I am honest, I prefer Champagne, but if there is none around, then I do love a glass of Prosecco with my friends!